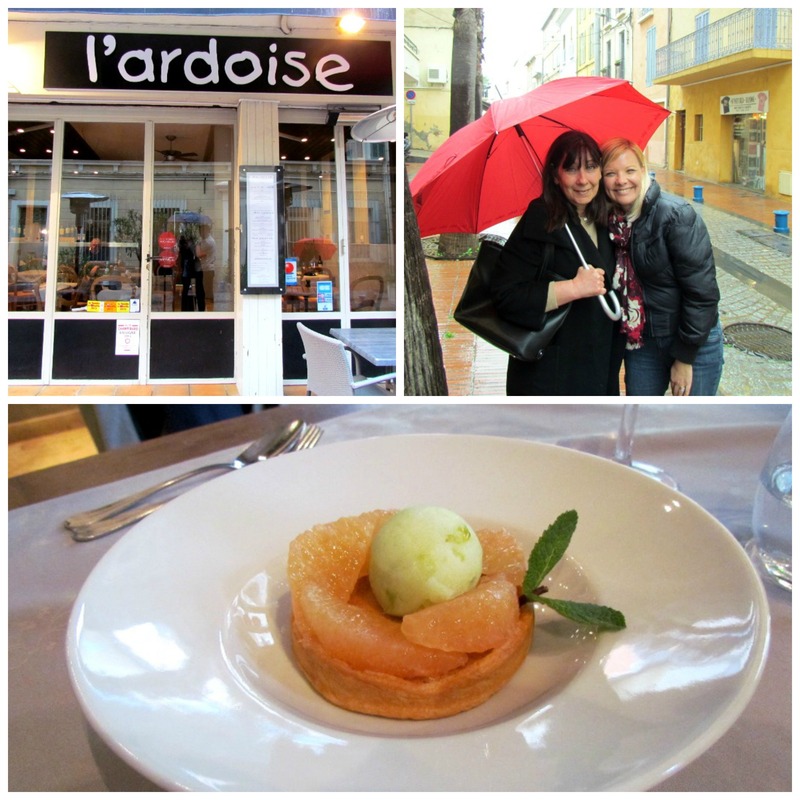 It was on one very rainy spring weekend that we found a bright spot at L’Ardoise restaurant in Bandol. I hadn’t heard too much about this restaurant except for the great reviews online, and since our friend Sue from Boutique Provençale was in town, we decided to give it a go. Admittedly, it was with a bit of hesitation that we booked as 1) it’s always a risk to try a new place as we’ve often been disappointed and 2) L’Ardoise is a stones-throw away from our undeniable favorite restaurant (*cue the trumpets*) of all time, L’Esperance. But at the hands of chef Jonathan Doudeau, we were far from disappointed. L’Ardoise proposes fresh, quality products and a choice of menu options that went perfectly with the season. I opted for an asparagus salad with roquette salad, balsamic vinegar and socca (a type of chickpea “bread” from Nice) and I also had a lovely piece of cod with a “barigoule” of beans & ham. My companions chose mouthwatering dishes like scallops with parmesean risotto & parsley-cream soup and lightly-grilled tuna with bok-choy, thai sauce & puréed sweet potato. And as often is the case in these très classy French restos, the desserts were the real “show-stoppers”. Nicolas took a pine-nut tart – delicately topped with grapefruit & lime sorbet, while Sue and I went “all in” with our choice of lavender crème brûlée with violet crème. As Sue so rightly advised, it’s best to be careful with lavender desserts as they can often taste like a bit like, well… soap (!). Located on a quiet street behind the busy “boardwalk” of Bandol, L’Ardoise is an excellent choice for a gourmet lunch or dinner and a great opportunity to experience refined, French cuisine that doesn’t break the bank. 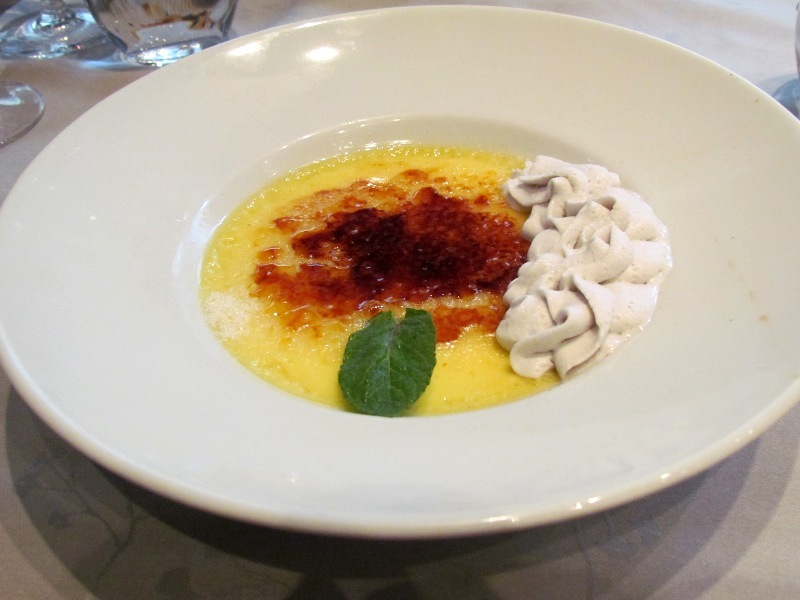 I’m remembering that lovely creme brulee as I type this!! Look forward to seeing you both again when I’m back in May. The food at L’Ardoise looks amazing. L’Esperance remains high on my list. You probably know from my posts that I generally love restaurants that are awarded Bib Gourmand by Michelin and L’Esperance has that plus a bunch of other great reviews.